"We leveraged the expansive knowledge of Mac-OU INC staff members in how to structure the merger deal. Mac-OU INC is also offering continuous ongoing support to assist with additional funding, such as recent Business Accelerator Funds which have allowed for us to bring on a consultant to assist with Department of Defense customer development. It's opening up many new doors." Sterling Heights, Michigan — Oct 20, 2014 — Coliant Corporation, a client company of the Macomb-OU INCubator (Mac-OU INC), recently merged with Laystitch Technologies LLC and Automotive Seat Climate (ASC) Craft LLC in a strategic partnership of personal climate-control technology resources and opportunities. By joining forces with Laystitch, Coliant will improve its deliverables to customers through the right teams, systems and manufacturing processes. Merging resources will translate to more extensive and innovative solutions for these customer bases. "We leveraged the expansive knowledge of Mac-OU INC staff members in how to structure the merger deal. Mac-OU INC is also offering continuous ongoing support to assist with additional funding, such as recent Business Accelerator Funds which have allowed for us to bring on a consultant to assist with Department of Defense customer development. It's opening up many new doors," John Swiatek, CEO of Coliant, says. Their new joint technology, Tailored Fiber Placement, allows customers to orient fibers in products to create a substantially light-weight part that is relatively stronger with a lower production cost. Verified by Oakridge National Laboratories and Michigan State University Advanced Automotive Composites Laboratory, this breakthrough technology leads the industry with vehicle weight reduction. "Our goal is to change the industry, and we are crazy enough to think that we can do it. We want to raise awareness of our solutions to industry customers. We have unique approaches to some of these processes that are not more costly, they are just safer and more efficient. We're here to challenge some of the misperceptions and perceived paradigms," Tommy Fristedt, president of Laystitch and ASC Craft and Director of Technology at Coliant, says. LayStitch Technologies produces the LayStitch™ Machines, utilizing Automated StitchAttach™ Technology to join a variety of wires, tubes and/or fibers with carrier materials. This enables these new products to be manufactured more precisely, and often at a significantly lower cost, by using fewer and less expensive materials and consuming less power. The ASC Craft mission is to act as an independent technical source, supporting the growth of the global automotive seat climate industry. Specialties include optimizing seat climate technology for improved fuel economy, reduced weight and reduced cost; improving the safety in heated seat systems for reducing burn risk to paraplegic users and thus the potential for costly litigation; and energizing with high-performance research, development and product management methodology for improving product functionality and quality at a lower cost. Based in Warren, MI, Coliant Corporation was founded in 2004. Coliant's unique electrical components improve the comfort, convenience and safety for riders of open-cabin vehicles. Although focused initially on the motorcycle market, its Powerlet, Atomic Skin and Luggage Electrix product lines have applications in numerous consumer, commercial and military markets. Coliant designs, manufactures and distributes rugged electrical accessories that are intuitive and universally adaptive. Coliant has multiple patents and sold products in 67 countries. 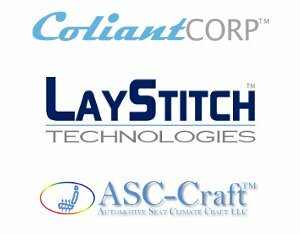 Visit coliant.com for an overview of all the technologies including microclimate, seat, tailored fiber placement and rugged electrics. The Macomb-Oakland University INCubator supports economic development in Southeast Michigan by accelerating high-tech businesses, cultivating academic innovation and encouraging research & development. To help small businesses grow, the incubator creates customized success strategies for startup and emerging companies in the niche industries of defense, homeland security, advanced manufacturing and technology. For more information, visit the incubator website at http://oakland.edu/macombouinc.